Requirements: You need Night Life Expansion Pack, Patience. Build your house foundation. It can be any shape, but it must be 1 tile or more away from the Driveway. When you build your Driveway, use both the Driveway and the Extension. 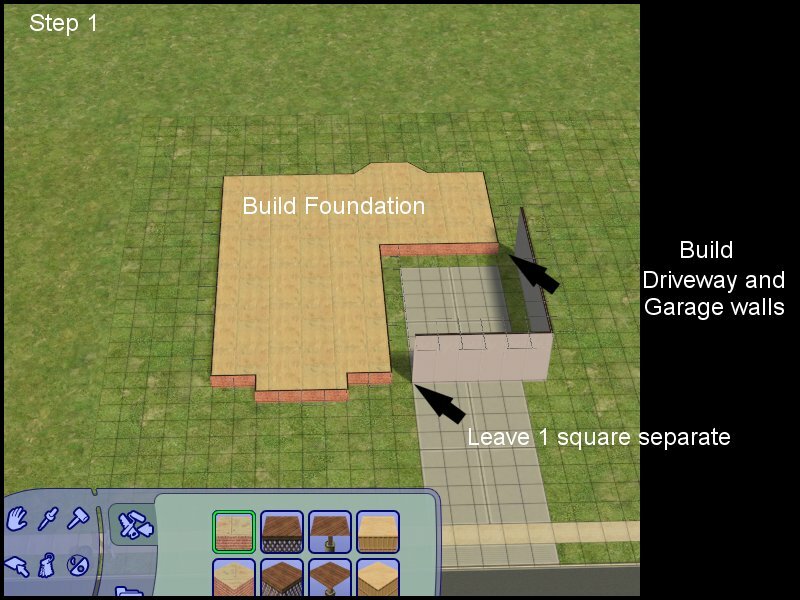 After you have done this, build your garage walls, knowing that it can't connect up to the foundation yet. You will end up with the same as Picture 1. 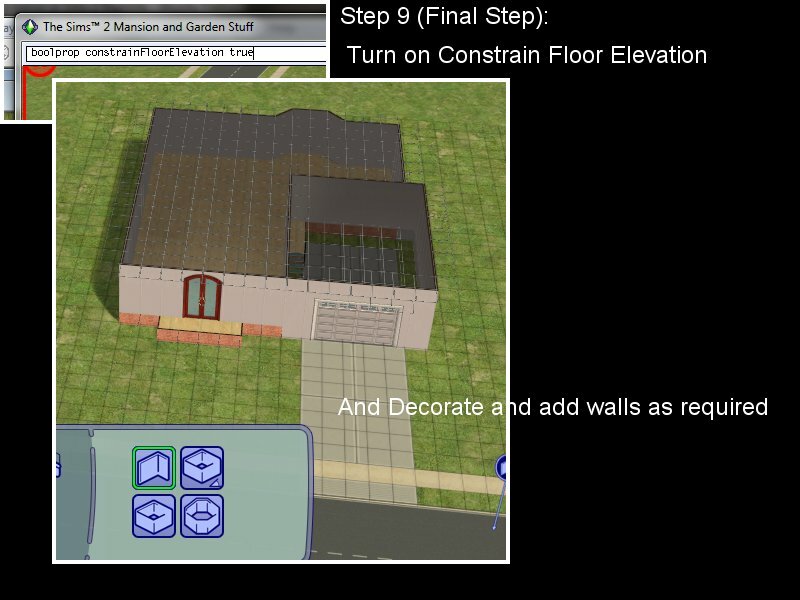 STEP 2: Turn off Constrain Floor Elevation. What this does is allow floors and walls to warp. It will allow us to add a wall that will be as tall as the wall on both sides, and will drag the foundation up to meet it. Constrain Floor Elevation true = don't let the floor tiles next to each other be different heights. 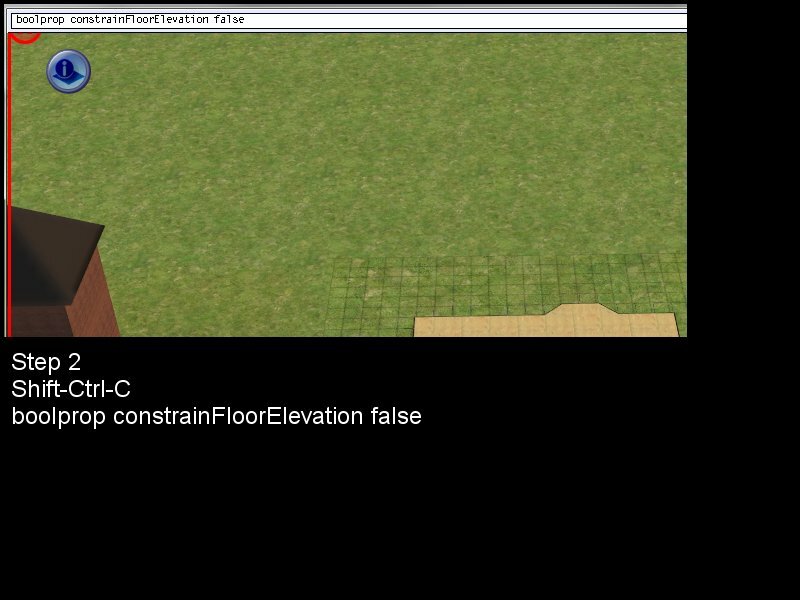 Constrain Floor Elevation false = let the floor tiles next to each other be different heights. 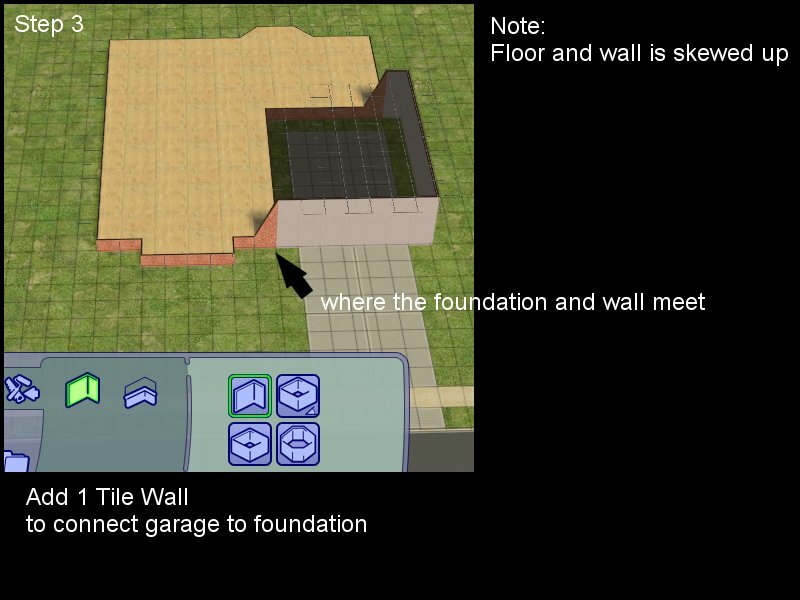 Note: When you have Constrain Floor Elevation off (False) - even adding walls to normal foundation or ground where the tiles next to each other are the same height, can end up with walls and floors skewed. It's important for you to check your walls and floor always. 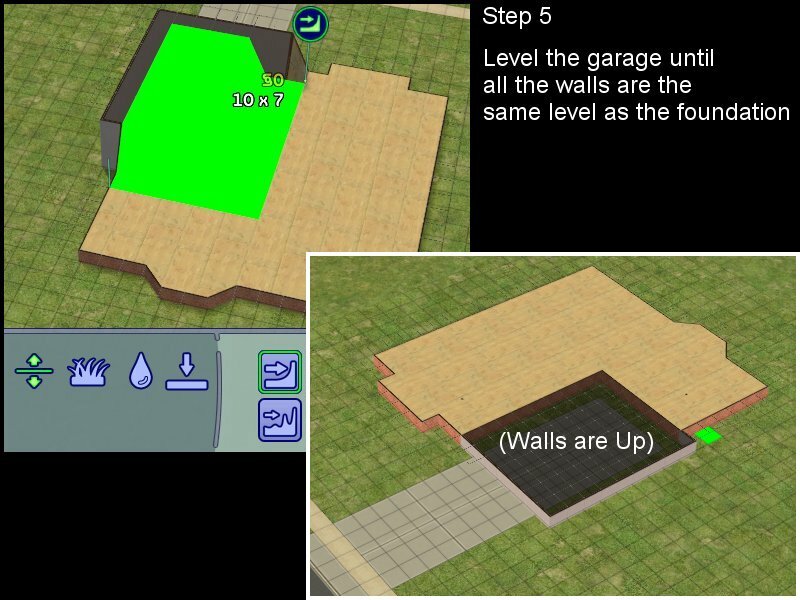 STEP 3: Connect your Garage to your Foundation. This will be a 1 tile wall where the gaps were. Note you will see that the foundation is pulled up to meet the height of the wall, and the floor there will also be skewed up. If you decorate and add things at this point you will note that the floor will remain skewed - this is because the foundation is pulled up to wall size. So don't bother. This tool is the reason why we use the Constrain Floor Elevation. It can be used on more than just terrain, it can be used on any floors on any level. This means that we can change the height of our walls using it. STEP 5: Level the Garage wall to Foundation Height. 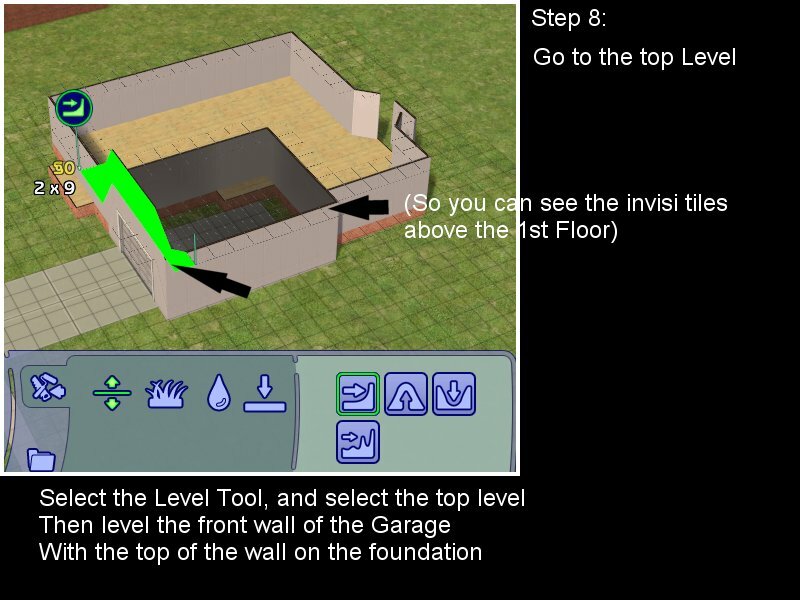 Using the Level Terrain tool, Click on a foundation that is level, and extend it as far as you can over the garage. You may need to do this multiple times. You are finished when the Garage Wall is the same height as the Foundation. Note - Your skewed walls and floors are no longer Skewed. STEP 6: Constrain the Floor Elevation and add walls. A cheat way to do this, is open up the command window, and then click the up arrow, it will bring up the previous command, then just change the false to true. Saves keying it all in. We're constraining the Floor elevation to stop us from undoing what we've done. What we've done is create a 1st floor on the ground for the garage that is only at foundation height level. Now we're going to add the walls on the next level up. 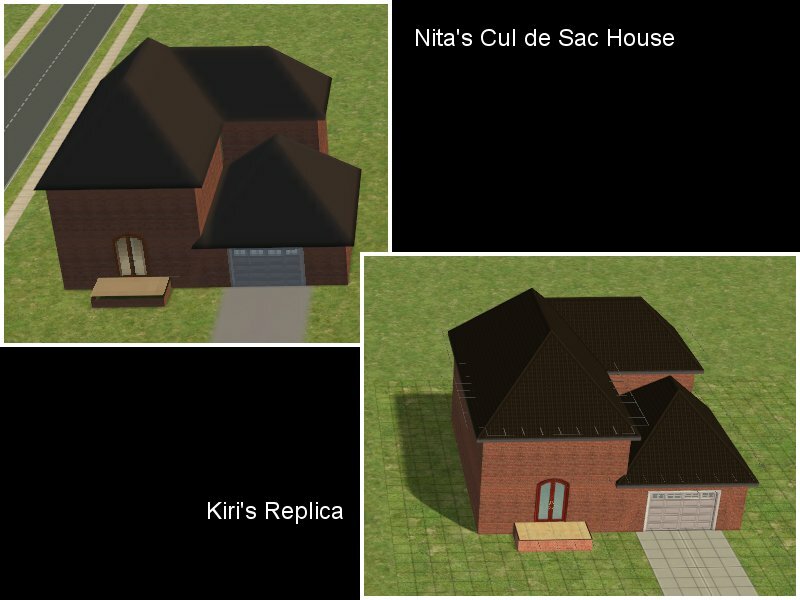 So add your exterior walls, including the walls that join the house with the garage. You'll notice that you can add the walls fine, and they are not warped, nor do they warp the floor. This is because we've turned on the Constrain Floor Elevation. (Note: Don't worry about the wall I accidentally put on the ground instead of the foundation - I fixed it up later. You'll also notice that I added the stair foundations in the garage. You could do this earlier, but I did it now because I forgot earlier). 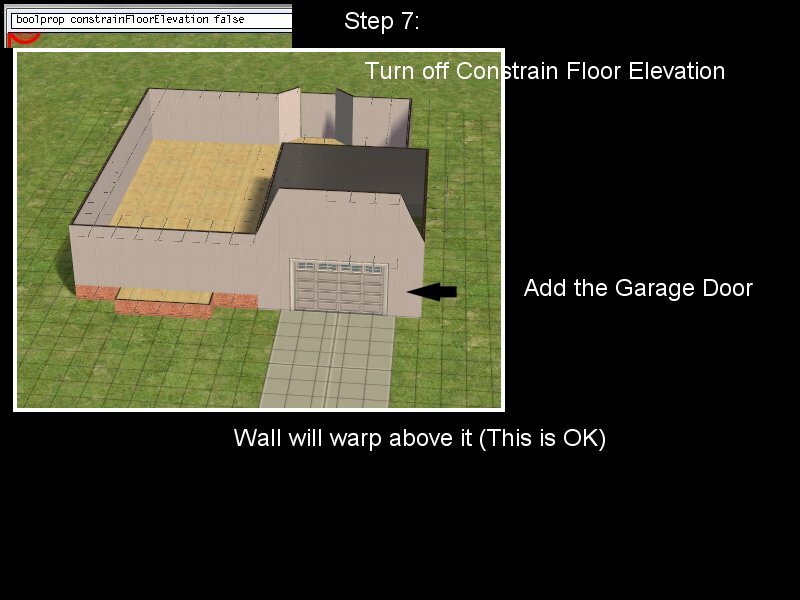 If you don't turn off the Constrain Floor Elevation, the Garage door will not be able to be added. You'll know if its added correctly, if the wall above it warps. The reason why this happens, is that the Door causes the walls it's added to, to return to Wall height. 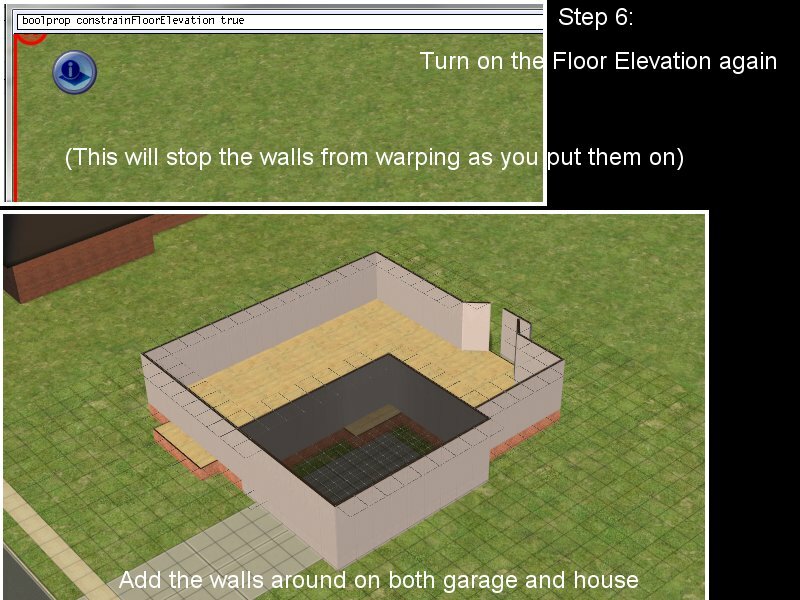 So you have 2 levels of Wall height walls, next to 2 levels of 1 foundation and 1 wall height. This is exactly what we want, because we want the door to be able to be used, and it can't be used without this part of the wall being the right height. STEP 8 Go up and level the top level wall. 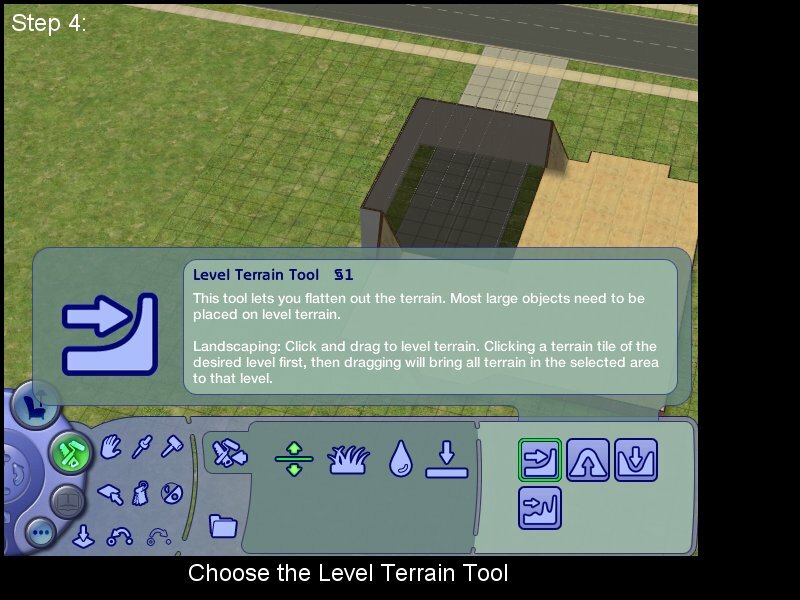 Select your Level Terrain Tool, and click on the invisi-tile on top of the wall where there is no warping. And drag it across the length of the front garage wall. What you are a getting at the garage door, is a wall that is wall height, with the 2nd level wall that is foundation wall height. This way you have no warping. Constrain the Floor Elevation so there will be no more warping. This will now allow you to get on with the important tasks of building the house, and decorating. Comparison - You can see it looks the same. The difference is that the floor and walls aren't warped. I have all Expansion Packs and Stuff Packs. Thank you very much kiri!! Thanks Kiri, I can't wait to try it out, it's something I've wanted to do and never been able to. The warping (crooked) on the wall is due to CFE. I usually choose a plain wallpaper like a stucco or paint for that part so it's not so obvious. Karen is absolutely correct. I would use a plain wallpaper, that doesn't show the warp. Looks beautiful, and definitely more pretty! Congrats deb on learning something new That looks really great!